Staying happily married has become a difficult proposition in recent times. Although the institution is still firmly embedded in our culture, divorce rates have steadily climbed since the 1960s. While some marriages are truly divorce-worthy, many other broken marriages can be saved. Recent emphasis on personal needs and greater social acceptance of divorce and alternative lifestyles may have weakened the resolve of partners to work through their problems. Furthermore, many couples may not realize that problems in their current marriages are likely to surface in other relationships. Consequently, while they may consider divorce a solution, it may in fact only be a stepping stone to the next relationship where patterns may repeat. Solving marital differences can be difficult. They tend to be linked to or caused by other problems, and that can make it hard to identify the real reasons for conflicts. Without knowing the true nature of their problems, couples cannot arrive at solutions that actually work. To understand the underlying issues that plague many marriages, the authors look to the research conducted on the subject over the past fifty years and to real life stories of success and failure to outline the major issues that detract from marital stability. 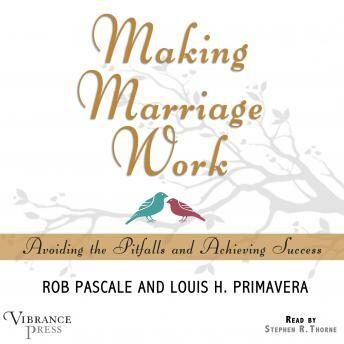 Drawing on Louis Primavera's twenty-five years in private practice as a marriage counselor, each chapter is peppered with anecdotes that every married person can relate to, and that help bring issues to life. The authors also propose frank and honest solutions that can help couples have more satisfying relationships. Anyone looking to improve their marriage will find suggestions for sussing out the underlying problems they may be experiencing and guidance for addressing those problems.